The Old Hamilton County Jail is a historic building at 501 Northeast 1st Avenue, Jasper, Florida, United States. It was added to the National Register of Historic Places in 1983. The Old Hamilton County Jail now serves as the Hamilton County Historical Museum. Wikimedia Commons has media related to Old Hamilton County Jail. The Hamilton County Historical Museum consists of a jail. ^ "Hamilton County Historical Museum". Florida Heritage Tourism Interactive Catalog. 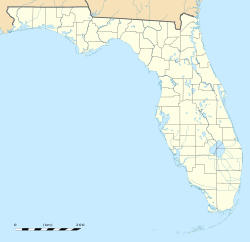 Florida's Office of Cultural and Historical Programs. 2007-02-20. This article about a property in Hamilton County, Florida on the National Register of Historic Places is a stub. You can help Wikipedia by expanding it. This Florida museum–related article is a stub. You can help Wikipedia by expanding it.